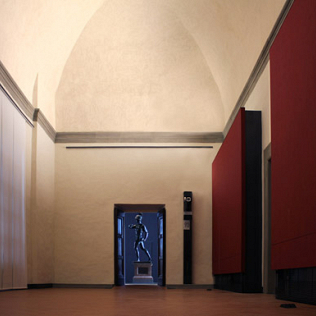 The Verone sull’Arno is a large passage room in the path of the gallery. \"Verone\" means loggia or terrace. In this case, it indicates a large room with big windows overlooking the Arno River and the square of the Uffizi. The Verone is at the end of the new path of the so-called \"Red Rooms\", which house works of Florentine Mannerism, with special attention to the relations that link this art to the ancient one. You arrive at the Verone at the end of the Red Rooms. It leads to the rooms dedicated to Caravaggio and the Caravaggesques. The room is therefore not just a place of passage, but marks a significant junction in the museum tour. It hosts three works of monumental size, which come from the Villa Medici in Rome. The Medici Vase is a large Neo-Attican crater of the first century BC. On its surface the Achaean heroes - before leaving for the Trojan War - who consult the oracle of Delphi are depicted, in bas-relief. Then, we meet the Mars Gradivo, a statue by Bartolomeo Ammannati (1511-1592), the author of the Neptune Fountain in Piazza della Signoria. On the opposite side there is Silenus and Bacchus, a copy by Jacopo del Duca from a Roman sculpture (in turn from a IV century BC bronze original). In the Roman villa, the three works adorned the loggia overlooking the garden, now they make this Uffizi space unique.